Not Much Hallow’d about ‘Ween | A Daily Dose of Zen Sarcasm! The festivities started early for some…, originally uploaded by Madame Meow. Yes. That's a puddle of vomit in that picture. Halloween is a funny holiday. As we are all aware by now, it's not just a holiday in which kids dress up and ask for candy and people decorate their homes with spooky themes in some vague reminiscence of a Druid New Year Festival. 1. an opportunity for adult women to tap into their inner Raging Sluts and make even the most subdued outfit choice (garbage bag? 2. an opportunity for all parents to see their kids at their very worst –with a raging sugar high and in a mob mentality– in one of their cutest phases (young, adorably decked, fawned over by others), all at the same time. 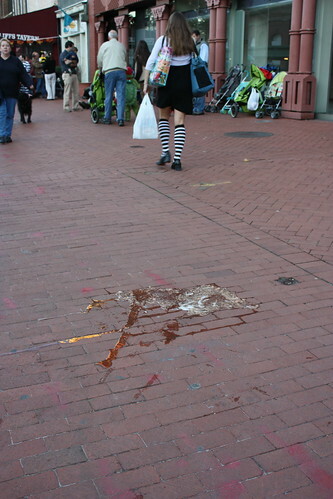 5. and finally, an opportunity to see vomit upon a city sidewalk. The raging part is optional here, I think. I realize that people throw up on sidewalks with some frequency. I still remember a girl I used to know in high school, who was complaining that her stomach hurt and she felt woozy all during the ride to school. As soon as the buses arrived and we started going up the hill, she turned a violent shade of green and a few seconds later, we were treated to seeing her projectile vomit onto the corner of a building in an apotheosis of retroperistaltic power. I can close my eyes and see her vomiting prowess, fifteen years later. But vomit is sometimes all that remains, isn't it? All those 75% off decorations and must-sell signs and half-opened polyester wonders bear a stark resemblance to vomit, just as much as this candy-overload picture does. 02 Nov	This entry was published on November 2, 2008 at 11:40 am and is filed under NaBloPoMo, Onerous Onomastics, Photoblogging. Bookmark the permalink. Follow any comments here with the RSS feed for this post. Funny observation 🙂 Although I loooove the excuse for mass candy consumption and will confess I love any reason to pull out a costume, preferably paired with a fantastic wig! saw vomit on the boardwalk outside the Rio and thought of you ! KBee: I am honestly touched!